Hatters boss Nathan Jones has warned his squad that he won’t accept any passengers during his time in charge of the club. With a large playing staff that the manager has already spoken about trimming during the summer to form an elite squad, Jones made it clear that only those with the correct work ethic will be staying on. 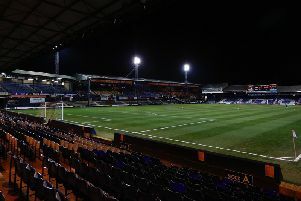 He said: “I don’t want any passengers, I don’t want anyone just sucking the life out of Luton Town and we won’t have those players, those passengers that just trickle. “We want hungry, good, desire players, that want to play for Luton Town, they’ll be no passengers. “We’ve got a good mix at the minute though. (Scott) Cuthbert’s a good age, (Alan) Sheehan’s at a good age, they can help the youngsters and those youngsters coming through. With three enforced changes due to injury during the 1-0 win at Plymouth on Saturday, it meant Paul Benson, Danny Green and Magnus Okuonghae all had to come off the bench to more than play their part in the win. Jones knew that would the case too, saying: “Benno isn’t a passenger, Benno’s one that competes. If you look at the bench, we’ve got options to bring on and that’s superb as we’re going to continue with that and get stronger too. “We don’t call them subs, we call them game changers. They train at the level, so that when they’re needed, they come on and they impact.